Lithium may be effective as a mood stabilizer, but questions often come up about its safety, particularly with regard to kidney or renal effects. A recent very large study published in November 2015 in JAMA Psychiatry looked at a huge dataset from Denmark in order to provide the best information we have now about these risks. The study consisted of records from 1.5 million randomly selected Danish patients, and compared those records with the records of all patients who had a first psychiatric inpatient or outpatient contact and were diagnosed with a single manic episode or bipolar disorder between 1994 and 2012 (n=10,591), and all persons exposed to lithium (n=26,731) or an anticonvulsant (420,959) identified on the date of their first prescription between 1995 and 2012. “The most important finding in our study is that lithium can be used in a safe way, not resulting in end-stage chronic kidney disease,” wrote Dr. Lars Vedel Kessing of the Psychiatric Center Copenhagen. “Another important first-ever finding is that bipolar disorder per se is associated with chronic kidney disease independently of drug treatment. This is most likely due to the increased cardiovascular comorbidity, and our finding together with other data emphasizes that we should put more clinical attention into diagnosing and treating these comorbidities,” he added. Two intriguing findings from the study were that there was an increased risk of both kinds of kidney disease in people who never received a prescription for lithium (in other words there was some increased risk that was associated with just being bipolar). 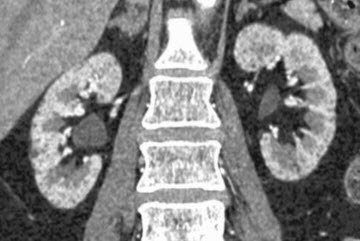 This was not a trivial increased risk. The results are summarized in the image to the right. Another intriguing finding was that anticonvulsant treatment (an alternative to lithium) was associated with an increased risk of end stage kidney disease. In summary, lithium is associated with an increased risk of kidney disease, which usually shows up as a slowly increasing creatinine (why we do regular labs in all of our patients). With the monitoring done in Denmark among those treated with lithium, there does not appear to be an increased risk of severe or end stage renal disease (requiring kidney transplantation or dialysis). 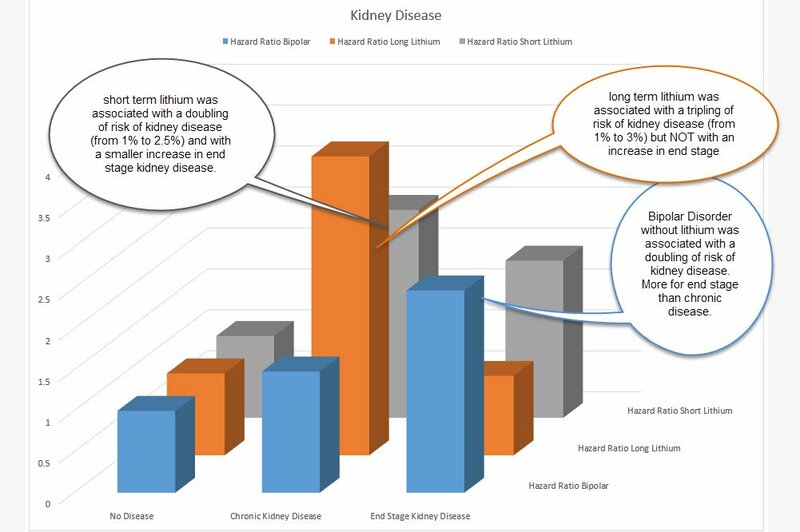 Bipolar disorder itself was associated with a significant increase in kidney disease in those who don’t get lithium treatment. That last point is quite important. The risk of death by suicide in bipolar disorder is higher than the risk of any kind of kidney disease in this study (3-5% versus 1.5 – 2.5%) and so the overall effect of lithium on mortality would be estimated to be favorable, especially given the evidence that the kidney disease risk was NOT for end stage kidney disease.